I've just been invited by Rachael Solomon who is the Program Director of the Edward Hopper House Art Center in Nyack, NY to have a mini solo show in one of their galleries.. We'll be showing some of my paintings of the interior of Edward Hopper's Cape Cod studio where I've had the great pleasure of enjoying 13 residencies since 1983. The Edward Hopper House Art Center is the boyhood home of the famous American realist artist. So much of what Hopper became stemmed from his early years there. So I'm excited to do the exhibit. It will be coming up in March through May of 2012. Hopper didn't teach. Yet I learned more about how to become a good painter by studying his work than by any other single thing. Art after all is visual. Words, even beautifully and aptly spoken can get in the way. And Hopper was legendarily tactiturn. 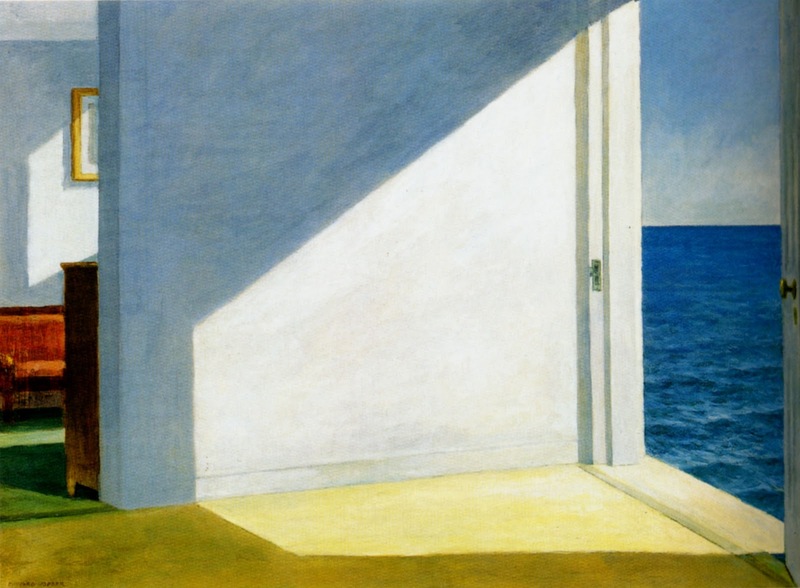 I suspect had someone asked Hopper how to paint an empty room, his terse reply would have been "Don't!". 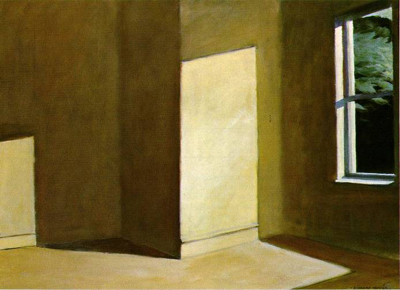 Above is one of his last oil paintings, Sun in an Empty Room from 1963. It's the emptiest of all the rooms he ever painted. Yet it draws you in and holds your attention as well as any richly appointed interior. How did he do this? In a way he followed the imaginary advice I have him giving above- his room only appears empty. The boldness of the sunlight on the wall bowls you over it is so bright. As you look longer you come to see the thousands of gradations from slightly lighter to slightly darker. And his yellow walls are actually a family of yellows migrating from warmer to cooler and from more intensely colored to more silvery and greyed-out. 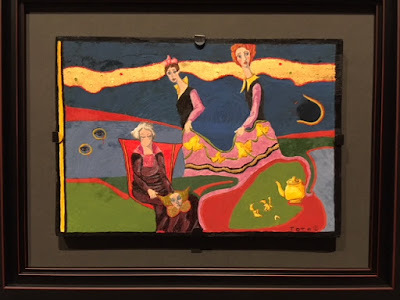 I used to have a teacher in my graduate painting program at Indiana University, Ron Markman, whose favorite painting word was "orchestration." And that's just what Hopper does here- he sneaks into the walls all sorts of information about the little flickering changes in the lights and the shadows and orchestrates them into a symphony. Hopper's "empty" walls seem alive enough to start breathing. One funny thing about the painting is the perspective he used. It's an invented space and Hopper casually breaks the rules about how perspective orthogonal lines are supposed to gradually converge to a distant vanishing point. His careen together at impossible angles, but it matters not at all. So firm is his hand telling you to focus on the shapes of the sunlight and the shadows that 99% of his viewers will never notice. Above is an old favorite, Rooms by the Sea, from the Yale University Art Museum. I've written about this painting before. It's an architecturally accurate rendering of his painting room and his adjacent bedroom in his studio in S. Truro, MA on Cape Cod. But wanting the walls to come to life, Hopper tells a big lie. In reality those walls face due north. Sunlight never falls directly on them. Imagine this painting without the drama of those diagonal sunlight shapes breaking up the walls. They would indeed be too empty and the painting's amazing energy would drain away to nothing. 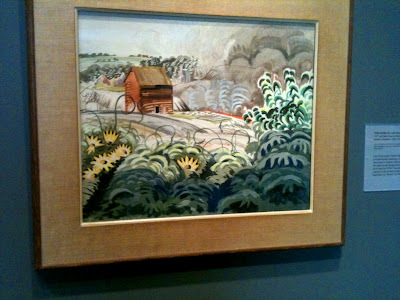 And below is another not quite as empty painting by Hopper from earlier in his career. It's remarkable as most of it is just the unadorned orange wall. But using the exact same device of diagonal sunlight breaking up the empty expanse, Hopper infuses the picture with a pulsating liveliness. 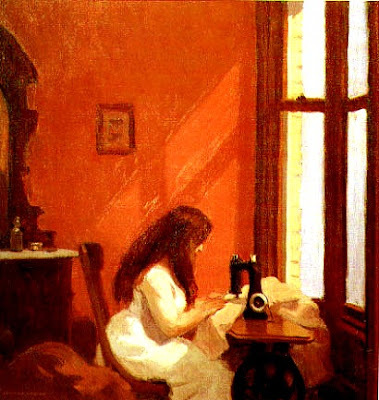 Hopper in this Girl at a Sewing Machine is orchestratring his empty wall space to dance with the figure. Look at how the long straight hair going over her shoulder and her bangs travel across the painting's surface at just the same angle as the shadows from the window frame move across the wall. This is a connection Hopper has installed into his painting that probably never really existed. But it connects the woman with the space around her in a way we come to love. It's not that Hopper is saying don't paint empty space. Rather his work shows how to make emptiness resonate with feeling. 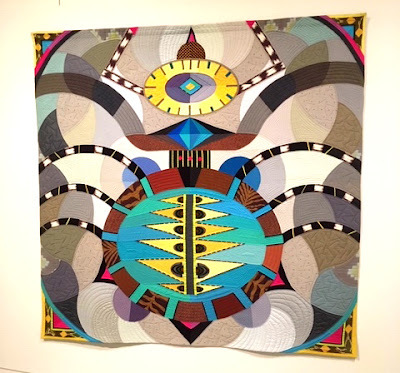 He invents little surprises of tones, changes in his color, and subtle interconnections with his shapes to make the empty seem full.